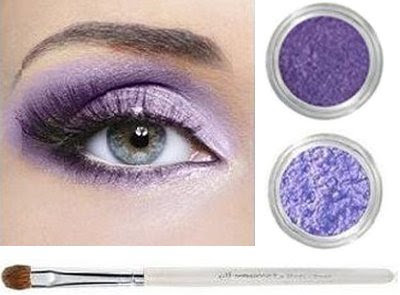 Lush Fab Glam Inspired Lifestyle For The Modern Woman: Winter Makeup Ideas: A Dramatic Pop Of Purple. 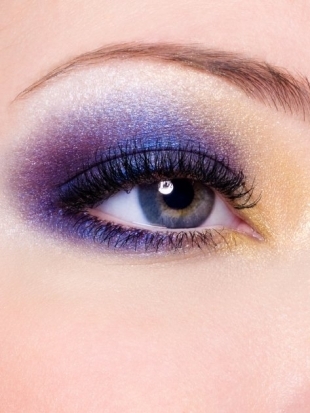 Winter Makeup Ideas: A Dramatic Pop Of Purple. Now that the winter season is here, you can get away with applying deeper, darker and heavier shades of makeup that you would not dare to wear during the bright spring and humid summer months. However the same makeup application rules apply and it is always wise to wear a lighter application during the day and then transition to a darker palette or smokey eye look at night. Light and deep purple smokey eyes will help you seamlessly transition from a sophisticated work day look with neutral lips (see photo above) to a glamorous evening look for a work/party event (see photo below). Create your makeup art by blending shades of yellow at the eye crease, cobalt blue on the eye lid and purple on the underbrow. If you love color you can make it even more dramatic by adding splashes of fuchsia to your yellow and purple eye shadow as well as a bright fuchsia lips, but we only recommend this look for an evening lounge/club event. This final look is a combination of the softness of the daytime makeup application with orange eye shadow over the lids and the dramatic effect of the deeper night makeup application with deep purple on the lower lids and white in the outer edges creating a unique Egyptian eye effect. *Refer to the eye shadow application diagram below to help with your beauty makeover. Are you a fan of purple eye shadow and which makeup featured above will you try? Leave a comment below. Wow!!! I love purples! I love these eye make ups. I wanna try them out too. I am going to try this when I attend a party this weekend.